Every morning, all month long, I have been doodling on a theme with my friends in CLMOOC (Connected Learning Massive Open Online Collaboration). My approach has been to keep it simple: I used a stack of very small sticky notes, and my doodles on a sticky note were often done in pencil. I purposefully kept myself to a short time limit — read the theme, get inspired, doodle and share. As a result, some of my doodles … look like they were done by a toddler with a big pencil (which is not to disparage any toddler artists out there, or the use of big pencils). Drawing has always been a creative weakness of mine, but I liked the freedom of the daily inspiration and I was often very impressed by the doodling of others in the #DecDoodle Twitter stream and elsewhere. 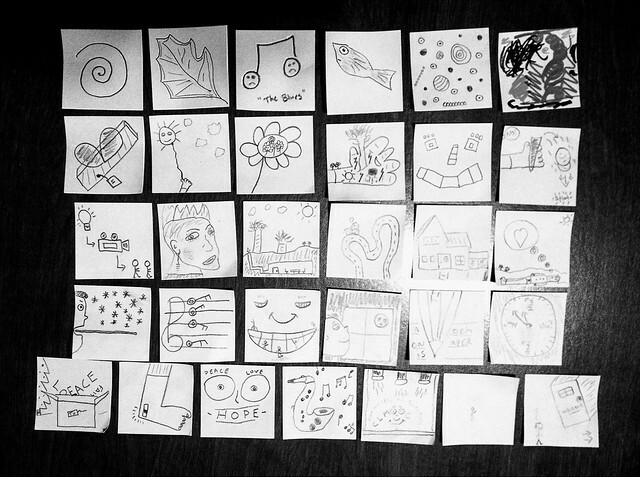 I gathered up all of my 31 doodles and sorted them, with a time-lapse camera running, and then put them all into an Animoto video. I lost the small bits of color I ever used in the doodles in this video theme, but I could not resist the party elements. 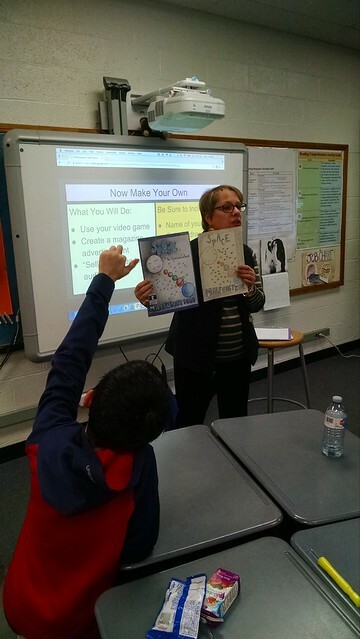 Thanks, in particular, to Susan W. for inspiring the month of making art in CLMOOC! 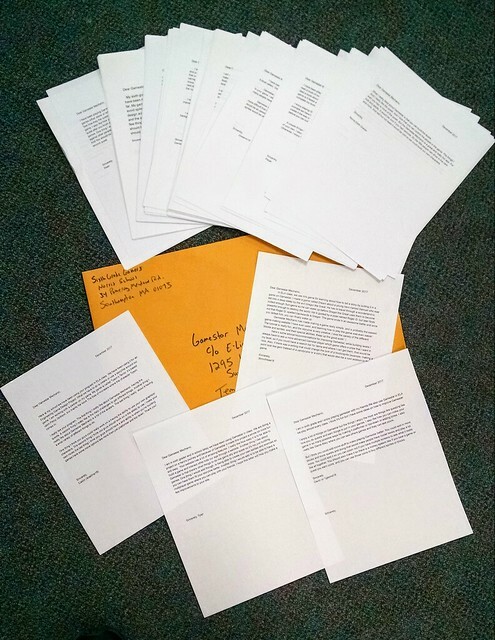 I’ll admit: it’s one of the oddest ways to “read” a piece of student work. 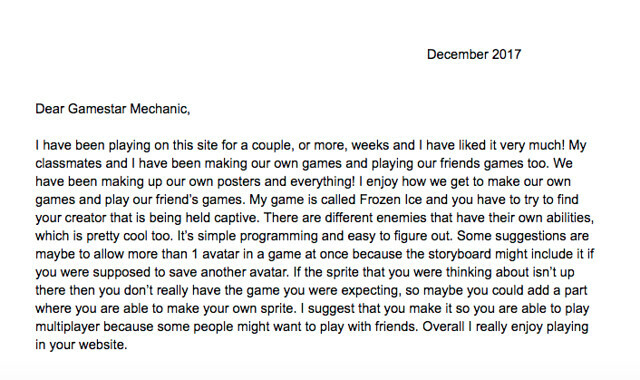 I’m digging into the video game of a sixth grader made on Gamestar Mechanic, trying to make my way out of the maze and rescue a character in my role as a hero on an epic quest. I am confronted by dragons, spitting out fire as I dodge and weave, and die. And then, I start the story all over again. 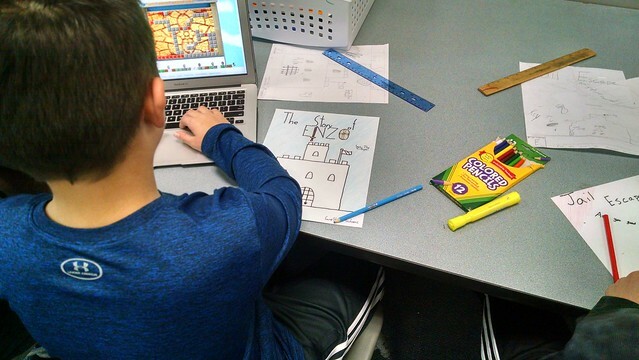 This is how I spent large parts of my vacation week: assessing student stories by playing the video games they have built with stories as frames. I’ve had a lot of fun, but I’ve also done a lot of thinking about what it means to tell a story in the format of a video game. Some of the projects are excellent. 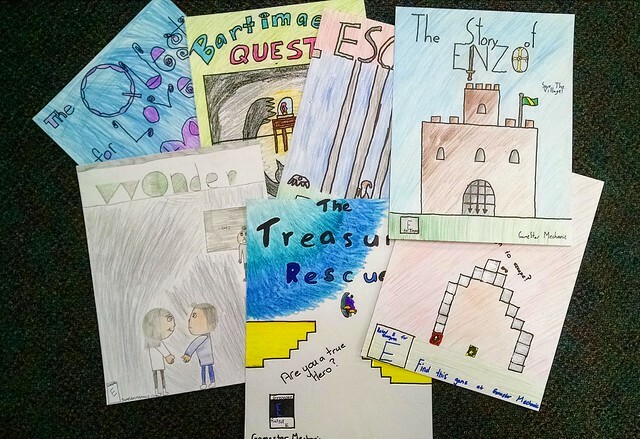 Games like Bartimaeus’ Quest by Hailey and The Wall’s Secret by Devin and The Quest of El by Megan show student game designers and writers who get it, who understand the idea of story informing the game experience. Other students, not so much, although all of the other writing and reflective work we have done has given me insights into their learning, and allowed me to focus my teaching. I have notes for our conferencing when we return to school next week. One of my favorite projects, not so much for its final version but for its origin, is a game called Captain Zero and Turtle Man. 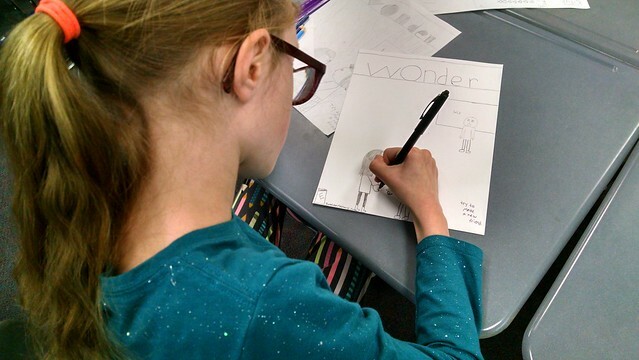 Two boys have been working on a comic book of the same title, and wanted to use their comic book story as the basis for the game they wanted to develop. Of course, I said, yes! I love when ideas from one genre spill into another. 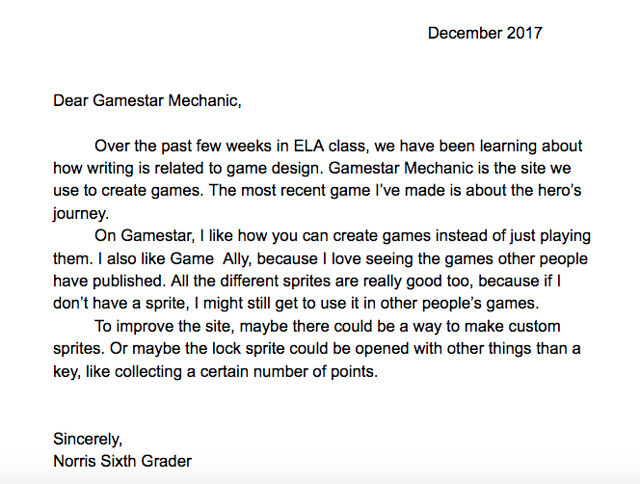 Given that this is the first time nearly every one of my sixth grade students has designed and published a video game, I am not overly strict with these elements (and our grading system is standards-based, meaning the range runs from “meeting expectations” all the way to “beginning to show understanding”). I am looking for growth, and for experimental writing of stories, and of games that engage and challenge and entertain the reader/player. As a teacher, this work is a very different experience than facing a pile of essays or stories or analytical pieces to read. 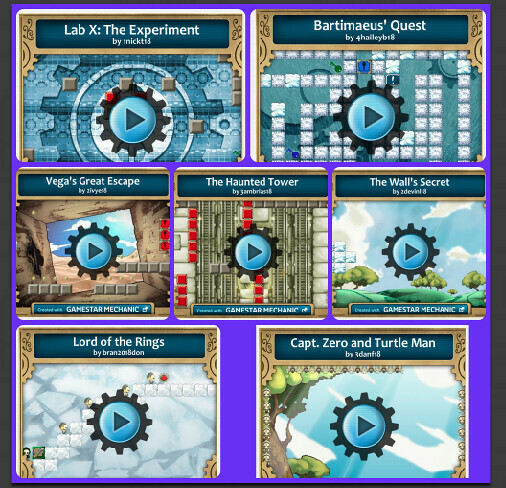 I am playing the stories of my students (often, over and over, for if I want to see how the story ends or continues, my only way forward is to beat the level and keep moving forward). 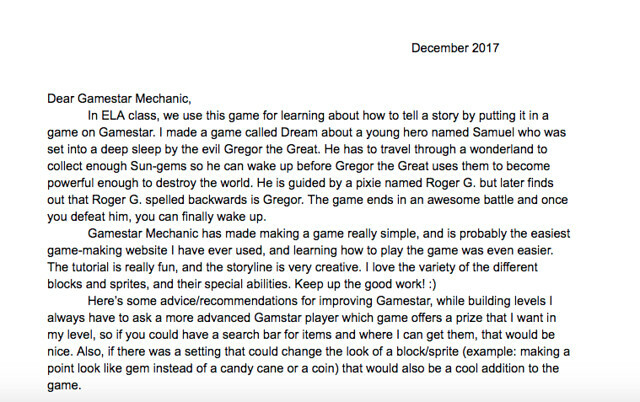 I leave comments both in public, at the game itself within Gamestar Mechanic, and privately, on an assessment sheet that every student will get back from me. I am intentionally balancing my remarks in those spaces, knowing that one audience is beyond the student and our classroom (but probably more important an audience than my role as teacher), and the other, is a space for more one to one with my young writer/game designer. I am critical in both, if I need to be, but more celebratory in public. My friend, Wendy, sent me a map from Australia. It is part of the CLMOOC Postcard Exchange, and last month, we were working on mapping as a theme in CLMOOC. Wendy’s map is a Soundscape — the drawn map connects to a playlist on Soundcloud that connects back to the map itself, all with an invitation from her to make a path on the map. I was intrigued and wondered how best to honor her invitation. I put on my headphones, closed my eyes, and let my imagination wander around her soundscape. Her mix was a collection of her own recording, and then chosen songs from within Soundcloud. I realized that the listening was giving me a way into her map, which was a sort of story. So I decided to jot down some ideas as I listened, and then found a poem emerging, which later became a sort of free-verse rap of sorts, with stanzas connected to different points on her map that connected to different music in her soundscape. I decided she probably needed to “hear” my poem response, and so did a version (listen above) and shared it out, hopeful that Wendy knows her map has kept me traveling forward. The words in parentheses connect to her tracks and her points on the map.